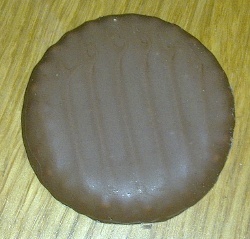 The Wagon Wheel is a biscuit that has an international heritage. They were first baked by Westons in the UK; when old Mr Weston died his three sons took over the business – one took the UK part, one the Australian and the other the Canadian. Subsequently Westons Australia were taken over by Arnotts. 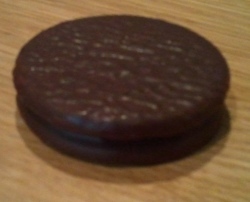 Interestingly the Australian full-sized Wagon Wheels are larger than the UK model (at 88mm vs 74mm). 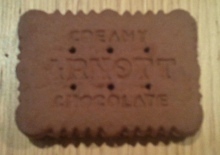 Perhaps this large size is what inspired Arnott’s to create the ‘mini’ version at just 54mm across. The Wagon Wheel is a classic. 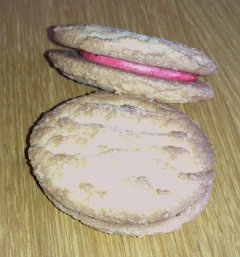 It features a thin chocolate-flavour coating, a sort of stale biscuit, foamy mallow and cheap red-coloured jam. Really not a very prepossessing set of component parts. However, when they are combined, something magical happens; they meld together in some sort of quantum union that makes the whole thing a triumph. Not everyone agrees, of course; they are a divisive biscuit that you either love or hate. I’m in the ‘love’ camp, however, and highly recommend everyone try them. It’s just one of those things you should do at least once in your life. I’d give these an eight out of ten. On Monday I needed to drop off a six-piece vintage tea service somewhere on the way to work. So I boxed it up carefully and strapped it onto the back of the Radish, and off I went. Anyway, I’ve tightened the thing tighter than a tight thing and all is now well. As I went up Anzac Bridge I passed several other commuters, decked out in cycling clothes on smart bikes, and it just made me smile so much. Not because I was faster (life is not a race), nor because I was wearing jeans (I wear cycling stuff often enough). No, it was the fact that I had a vintage tea service on the back of my bike. Somehow that just tickled me as I cruised past various people struggling up the hill. I take my hat off to Arnott’s; for a company that is basically serving a fairly small market they do manage to produce a huge number of varieties. I’m sure that a hard-nosed, Harvard-educated business executive would take one look at the company and slash the number of lines they do in order to focus on the profitable ones that move in volume. Well, I hope Arnott’s do not employ any such money-grubbing tycoon, and continue to produce such a glorious multitude. Even I am taken aback sometimes by the sheer number of varieties – and the other day I came across ‘Creamy Chocolate’ (yes, yes, pipe down at the back). I have to say, small corner shops are the best place to discover hitherto unknown Arnott’s biscuits. I guess the big chains decide on their range centrally and carry them in all their stores, whereas in the smaller places you can unearth some rare gems. It was in just such an independent grocers that I found ‘Creamy Chocolate’ (stop sniggering, Biggs Minor), so I bought a packet to try them. These look like a throwback to some long forgotten past. They are embossed with an olde-worlde font, and somehow lack the polished veneer of biscuit produced on modern manufacturing equipment. Whether this is deliberate, or it just reflects the fact that they are made on ancient equipment, I do not know. Creamy Chocolate (I’m not going to warn you again, Biggs) consist of two cocoa-flavoured biscuits sandwiched together with some kind of cream filling. The first thing that strikes you when you open the packet is the smell. They have a strong burnt caramel aroma which is tantalisingly familiar yet also hard to place. The taste is similarly enigmatic. There’s the cocoa there, to be sure, although the cream filling seems to have some faint lemon tang to it, reminiscent of washing up liquid. There’s other flavours in there too; a slight hint of candy and caramel. Finally, the whole thing is overlaid with that most instantly-recognisable-yet-hard-to-describe flavour known as ‘funny’. Yes, these biscuits have a slightly ‘funny’ taste. In fact, these biscuits taste exactly as if they had been lurking in the bottom of your grandma’s biscuit barrel for a long time, and had absorbed all the flavours from the thirty-year-old tin. It’s quite amazing, and not unpleasant – these biscuits kind of send you off into a sort of nostalgic reverie. It’s just all rather unexpected. Creamy Chocolate (that’s it, Biggs, go instantly and see the headmaster) are a very interesting biscuit, well in tune with the current vogue for things ‘vintage’. 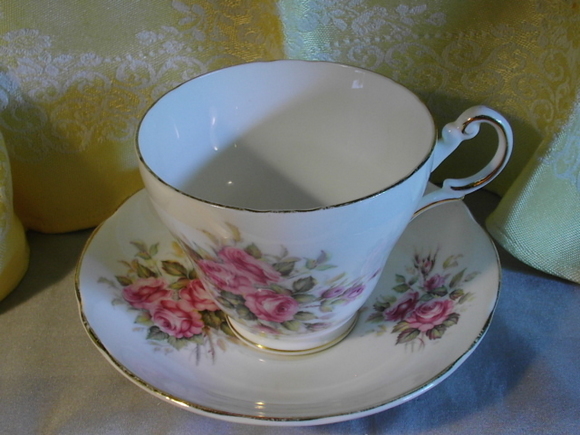 You could serve these on your vintage china wearing your vintage clothes, for example, and have people believe the biscuits were contemporary with the surroundings. I’m going to give these a six out of ten, with an extra bonus point for being so intriguing. I often wonder where the names for the various Arnott’s varieties come from. Did the inventors of the Kingston think that the combination of coconut and chocolate would make people think of Jamaica? Or did the development team hail from Kingston, Melbourne? 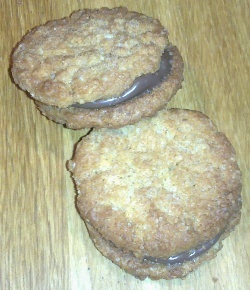 Either way, the Kingston is a tasty biscuit, consisting of a pair of crunchy, oaty biscuits flavoured with coconut, and sandwiched together with chocolate. This is one of the few oat-based biscuits in Arnott’s range, and I do feel there is room in the Australian biscuit market for more oaty biscuits, perhaps along the lines of the successful ‘Hob nob‘ from the UK. They have a slightly rustic appearance, with the two biscuits sometimes looking rather haphazardly sandwiched together, but this only adds to the charm, I think. They are very tasty too, and also dunk surprisingly well. If I had just one minor criticism it would be that the coconut is a little too pronounced; indeed peerless though most Arnott’s lines are I would venture that, just perhaps, their recipe development team is a little heavy-handed with the coconut in general. Still, that’s a minor niggle in what is a very nice biscuit. I’d give this an eight out of ten. 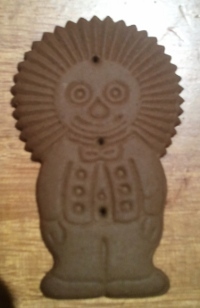 This biscuit was introduced by Arnott’s in the 1960s, although when introduced it was called the ‘Golliwog’. When I was a toddler I had a golliwog soft toy that my mum made for me – it was almost as big as me, and I loved it and took it everywhere. 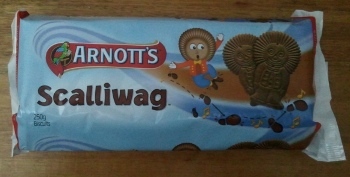 Unfortunately, the name ‘Golliwog’ has taken on racist and offensive overtones, so around fifteen years ago Arnott’s re-branded this line ‘Scalliwag’. The pack is decorated not just with a picture of the biscuits, but with jolly Scalliwags dancing around, leaving footsteps and musical notes behind them. (apparently Arnott’s at one time even made enamel badges featuring this character). So what are they like? Well, they are neatly embossed with a smiling Scallywag. There’s a lot in a packet too – twenty three, in fact(continuing Arnott’s penchant for having a prime number of biscuits in each pack). They are quite thin, and when you open the pack you are presented with a tightly packed platoon of Scalliwags, all facing the same way. For anyone who has ever had a bourbon cream biscuit, these are like the biscuit part of one of those, without the cream filling and the sugar sprinkles. They are flavoured with cocoa, although this is not all that distinct as a flavour, and are actually a bit kind of nothingy. They dunk fairly well though, and go down nicely with a cup of tea. I suppose, like all such novelty eateries, the question is whether you bite off the head first, or the body. I have to say, I did get a kind of juvenile satisfaction in dipping the head of my Scalliwag into hot tea before biting it off. Lets say five out of ten. 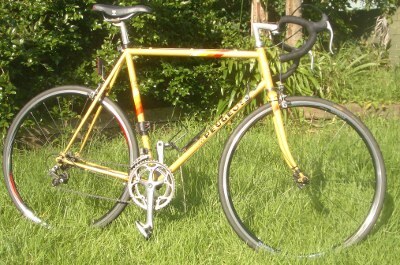 For some reason, I get a lot of google searches ending up on my blog searching for ‘vintage Peugeot bike’. Clearly it’s something people are interested in, so I thought I’d write about my vintage Peugeot bike. And if you smell a blatant attempt to increase the hits I get on my blog, well, you would be right. (Interestingly another common term is ‘granny smith apple’, which leads people to this post.). I bought the bike through eBay shortly after we moved to Sydney, as a bicycle seemed to be the best way to get to work. I used to ride a lot when I was younger, but kind of gave up when I got a car. How misguided I was! This $150 bargain not only got me to work faster than the bus, it also rekindled my love of cycling. Note the lovely curvy bars and the close ratio chainwheels – one with 52 teeth and one with 42. Old-school Wienmann brakes and a six-speed rear cluster on the original Helicomatic hub. These hubs were originally supplied with a tool to take off the cluster which also had a bottle-opener on it, but sadly this was not supplied by my eBay seller. The rims were ‘Rigida’ alloy. The dérailleurs were Simplex; you can see the rear one better on this photo. I don’t know exactly when it was manufactured, but the closest I can find to it is in this 1986 catalogue on the excellent www.peugeotshow.com website. 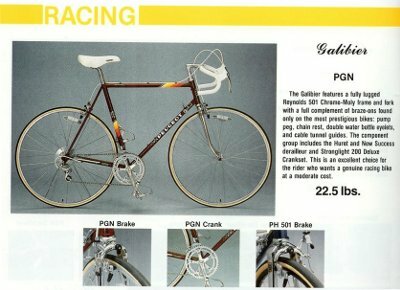 My bike is marked as a ‘Galibier’ frame, and has the Reynolds 501 tubing – however the components in this US catalogue model seem a bit more upmarket and clearly it’s red, not yellow. Still, I’m fairly sure it dates from around this time, as the frame graphics are contemporary. I rode the bike like this for about six months; too and from work every day. Then, going over the Sydney Harbour Bridge one morning, the rear hub bearings disintegrated on me. It all sounds very dramatic, but in reality it wasn’t; the back wheel went all wobbly and was rubbing on the brakes, so I stopped and gave it a wiggle. I decided to try and keep going, but as I started up again it gave another little crunch, and the wheel jammed up against the frame. I carried the bike the rest of the way to work, and at lunchtime took it to a local bike shop to see if they could fix it. The hub was shot, and in any case locating parts for a 1980’s French hub I don’t think was going to be easy for a Sydney bike shop, so they fitted a new wheel. To do this I guess they must also have cold-set the frame to widen the rear forks, although they didn’t mention doing it. They put on a rather ugly touring wheel with a seven speed cluster. I never really liked that wheel, so I replaced both the wheels with a new set of Shimano RH-500s with an 8 speed Sora cluster. The next drama that befell the bike was being hit by a car. Luckily I was not hurt, but the bike took a bash which bent one of the cranks slightly. I took it to a different bike shop in Balmain – Cranks Bike Store. They were very nice, and fixed it all up for me, including replacing the bars (which they recommended after a knock in case they were cracked). This was all paid for by the driver that hit me (she was at fault). So the bike then looked like this. New bars (which meant goodbye to the nice curves), hello to a Shimano Sora crankset (with a more contemporary 52/39 combo) and a new saddle. Note the original rear dérailleur is still on the bike at this point; it was just able to take up the slack in the chain and cover all the gears (given the wider ratios from the smaller front chainring and the 8 speed cluster), although the ‘small-quite small’ combos gave a rather droopy chain. (Not that you should use them anyway…). It wasn’t long after this that the spring in the rear dérailleur really started to give out, and chain tension became a real issue. So I bought a second-hand Shimano 501 one from eBay for $15 and put it on the bike – this improved the drivetrain markedly! By now I had been riding the bike every day for about a year, and figured I had saved enough in bus fares to splash out on a new bike. The nice people at Cranks set me up with my beloved Salsa Casseroll singlespeed, and the Peugeot languished at the back of the shed. I only rode it occasionally, usually if for example I was going to be locking it up outside for a while. When I did ride it, the thing that really struck me was how hopeless the brakes were. 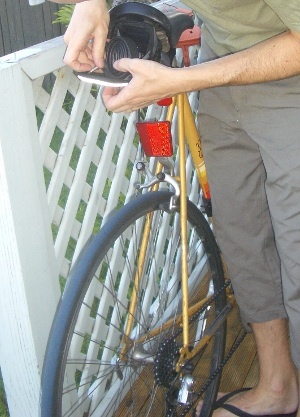 The modern dual-pivot brakes and aero levers on the singlespeed were a revelation, as was the fact that you could ride on the hoods and still be able to operate the brakes successfully, rather than just effecting a ‘gentle slowing’ – about as much as you coudl get from the old-school brakes on the Peugeot. So I got the nice Cranks people to change the brakes on the Peugeot for modern ones – Shimano long-reach brakes and Tektro levers. Hurrah! I could now stop, and I had an idea that I’d use the Peugoet for touring, carrying things and so on. I never really got around to doing that, and despite the shiny new brakes, the poor old Galibier stayed at the back of the shed as I bought bike after bike to do other things with. Very occasionally, I’d get it out to ride. And two things would bug me; one was that the bars were too narrow and the other was that the tyres were too thin (by this time I was a complete convert to nice fat tyres). Finally I decided that it was time to either get the thing so I would enjoy riding it, or get rid of it. Getting rid of a bike just seems wrong, so I bought new bars, a new stem and a quill stem adapter. I recounted my adventures with installing them here. By now it looked like this. At last the old Peugeot was back to being fun to ride. I rode it for a while, but then disaster struck. I got a puncture. And for various reasons didn’t get around to fixing it. And then Baby Chillikekab arrived. This meant another spell at the back of the shed, now with a dismal flat tyre. The reason for the flat was that the tyres were so worn – and in any case they were still the old narrow ones. So the other day I finally got around to buying new (wider) tyres. They are only 28mm, as 32mm ones aren’t recommended on those rims. But that’s still a lot more comfy and practical. 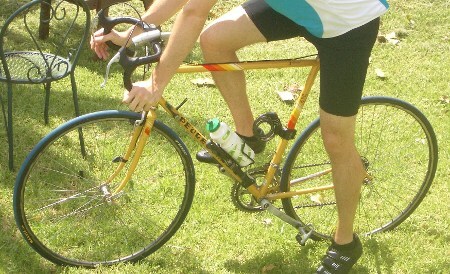 So I’m finally riding the vintage Peugeot bike again. And it’s a lot of fun. It’s probably the fastest bike that I own, and certainly the closest thing I have to a real ‘road bike’. Totting it all up, I’ve probably spent $1,000 on this bike since I bought it – money that I doubt I’d get back if I ever sold it. Still, it’s satisfying to give an old frame a new lease of life – and I still sometimes get admiring comments from other cyclists at the lights. Well, the tradition of wet long weekends continued last weekend, but that didn’t stop me getting out for a bit of a spin on Sunday morning. 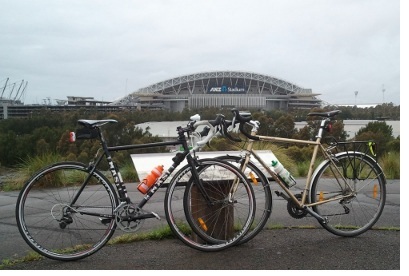 I met up with a mate, and we headed out west, towards Olympic Park. Now, I’ve ridden to Olympic Park lots of times, and know various routes to get there. However, on Monday we got lost. Probably too much yakking and not enough paying attention to where we were. So we ended up riding along a fair stretch of Homebush Bay Drive. Whilst riding on what almost amounts to a freeway is never entirely comfortable, the traffic was fairly light – and there is something quite exhilarating about riding along a wide, smooth, straight road – especially when it has a slight downhill. Makes you realise just how good the trunk road network would be for cycling if only they banned those pesky cars! We span (spinned? spun?) around OP for a bit; heading out on the paths to the ferry wharf. We got a bit lost again (!) but it didn’t really matter as we were just noodling around. Despite the rather poor weather, there were quite a few cyclists around. We then headed back at a good pace, finishing with a sprint up Lilyfield Road where I was rather embarrassingly dropped by my erstwhile riding partner. He’s got a lot faster since his daily commute more or less doubled in length, and he started talking all funny about ‘cadences’ and ‘interval training’. I’m going to need to put in some more hours on the bike to keep up! Still, it was raining quite hard by this point, so I had the consolation of swishyness, whilst he had a wet bottom. The Caramel Crown could have been awesome. It could have been a triumph. It could have been a contender. As it is, it’s only sort of quite good. Why? Well, they are topped, as the packet notes, with ‘gooey caramel’. Gooey. Gooey phooey. Surely this should have been chewy? After putting these biscuits in the fridge, I was expecting that caramel to at least harden a bit but it remained resolutely gooey. It’s a real pity, as I think this is a missed opportunity. Booey. In other respects, the Caramel Crown is nice enough. The biscuit has a malty taste, and they have a good thick coating of milk chocolate featuring attractive raised ridges; the chocolate cracks in a satisfying manner when you bite into them releasing the gooey caramel. Like all chocolate biscuits, they do need to be chilled; when warm they are just an over-gooey, over-sweet mess. They are also dreadful when dunked. Just don’t go there, even for curiosity’s sake. You’ll regret it. I’d give these a six or seven out of ten – but that could have been a nine had the caramel been a bit firmer. Riding home last night, I was stuck by the moody red lighting on Pyrmont Bridge. All of the street lamps have had red filters put over the globes; presumably it’s part of creating an atmosphere for the ‘Fiesta’ events over the long weekend. It was all rather tremendous, although it also made the bridge rather dark – with the filters the lamps put out a lot less light. Interestingly, it seemed to make the cyclists go a lot slower. I didn’t ride over at peak commuter time, but it wasn’t long after and there were still quite a few bikes around. What with it being so dark, it was really necessary to go slowly and take your time – which everyone seemed to be doing whilst enjoying the novel atmosphere. It struck me that it’s another example of the counter-intuitive nature of a lot of ‘safety’ initiatives; you might imaging that putting in better lighting would prevent accidents, but perhaps the reverse is true. It also points to why putting in a green bike lane across this bridge would be such bad news – it would make cyclists go faster, when what needs to be done is to slow them down. 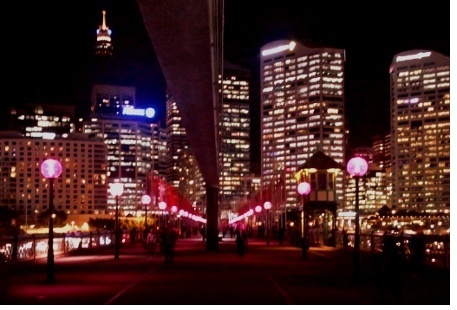 Anyway, Pyrmont Bridge was certainly very atmospheric last night; I hope they leave the red lights up permanently! Monte Carlo. A name imbued with decadence and romance; casinos and royalty, James Bond and Formula One. Just how have Arnott’s distilled this heady mix into biscuit form? 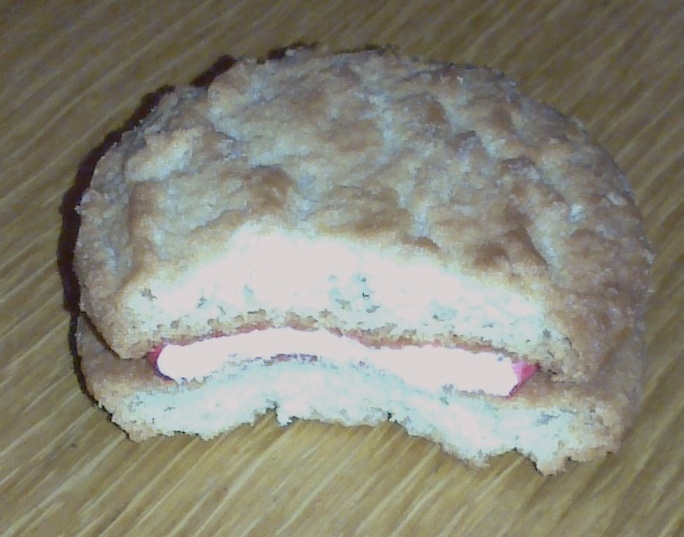 The Monte Carlo is a ‘jam and cream’ biscuit, and is a remarkable feat of biscuit engineering. On first inspection it seems like it has some sort of pink cream filling. However, you soon discover that actually that is a layer of sticky jam wrapped around a regular cream interior. I have no idea how they achieve this; I sort of imagine them making round balls of jam-coated cream, and then squashing them between two biscuits. The jam is really sticky; it gets into your teeth and adds a kind of chewiness to the thing which is somewhat unexpected. I actually think this i s a companion biscuit to the Iced Vovo. The Iced Vovo is a kind of throwback to British high tea, and this is the same. It’s an attempt to distil a jam-and-cream Victoria sponge cake* into biscuit form. I guess the ‘Monte Carlo’ thing is to give it a kind of continental sophistication – like taking English tea in the Hôtel de Paris. Like the Iced Vovo, its all rather fussy and overdone; this is a blowsy biscuit that is really trying too hard. It features some up-market ingredients – but only in trace quantities. The jam, for example, does contain raspberries – but is mainly apple, with raspberry not featuring until after such additives as food acid. The biscuit part contains honey, but way down the list along with raising agents and the like. In terms of re-creating the experience of eating a Victoria sandwich cake, however, Arnotts have excelled themselves. Victoria sandwiches are rather heavy, sickly affairs that make you feel a bit ill if you eat too much . The Monte Carlo re-creates this perfectly; there are twelve in a packet (a refreshingly even number), but your correspondent had to admit defeat after just seven – and the last one was really ill-advised and brought back memories of eating too much cake at parties. I’m going to give this a four out of ten. Clever engineering, but not a great biscuit. *For those interested, here is the recipe for a Victoria sandwich. Note it is important to only use British Imperial measurements; if you use metric equivalents or any kind of electric beaters the cake will not work properly. Grease two 8 inch cake tins and line the bases with baking paper. Set the oven to 350F. Tip the cake ingredients (butter, sugar, eggs, flour, and baking powder) into a large bowl and beat vigorously for about two minutes with a wooden spoon. Divide the mixture evenly between the tins and level the surface with the back of a spoon. Bake for 25 minutes, until risen and golden in colour. The cakes should be springy when lightly pressed. Leave the cakes in the tins for a few minutes, then run a knife around the edge of the tins and turn out on to a wire rack and leave to cool. To make the filling, beat the butter for the filling in a large bowl until soft. Add half of the icing sugar and beat until smooth. Add the remaining icing sugar and one tablespoon of the milk and beat the mixture until creamy and smooth. Beat in the milk, if necessary, to loosen the mixture. Spread one of the cakes with the jam, then a thick layer of the buttercream filling, and then put the other cake on top (top upwards) and sprinkle with icing sugar. Serve on a doily.